You might know that I am not a fan of Microsoft, but I do try to give them a chance now and then. My latest attempt was the use of Live.com, a search engine. I’m not even here to complain about the search results (though I did find it amusing the third result was a link to Google with my site’s url in it’s query string.) My complain is all in the UI and usability. Live.com uses some crazy scrollbar that doesn’t work like the standard scrollbar that millions of sites I’ve used does. 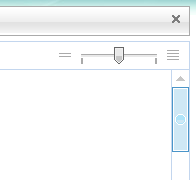 Nope, they decided to implement their own damn scrollbar. Someone decided that instead of working like 99.5% of the other web sites out there, that creating a custom scrollbar, that probably requires Internet Explorer 6 on Windows XP with a top-of-the-line Dell, would be sheer genius. Maybe it’s just because I’m a Firefox user with a Mac, I don’t know. It seems that Microsoft still doesn’t get the web, and believe me, I’m getting sick of saying that. I no longer get pleasure from it, and I hope someday I can say that Microsoft does get the web. Will that day ever come? Posted on Saturday, June 24th, 2006 at 11:00 am. Subscribe to the comments feed. Both comments and pings are currently closed. Post on your own blog. While I agree that when sites make their own scrollbars, 99.99% of the time it’s because they haven’t a f*ing clue. I wouldn’t put live.com in that category though, because what the scrollbar does is allow you to scroll through *all* the search results. Instead of a discrete 10 results per page, it’s a continuous stream of results. What I don’t like right now is that you can barely see three results at a time, but the infinite scroll is really cool. And it works in Firefox, although I’m guessing not everywhere since it doesn’t for you.